It started off as nothing more than a spin around South London, but by the time we were finished it seemed as though we had been on a pilgrimage. The heavy, slow-moving traffic didn’t intrude, giving us more time to talk about our musical hero whose untimely death had left his millions of fans stunned and heartbroken. David Bowie may have gone to the great gig in the sky and, as we sang along to yet another of his songs, it was with a mixture of pleasure and pain that was both equally uplifting and sad. The day was bright and cold and it was my first time in London since Bowie’s passing. My cousin, who lives in Dulwich, had sketched out a route that would take us to some of Bowie’s haunts from his early years. It was a plan that would allow us time to listen to his music and discuss his unique cultural contribution. We had often done this, usually late into the night, but with the great man’s passing it seemed more like a duty and something we just had to do. As he started the car and we moved off he clicked on the music player and the sound of Station To Station. ‘You drive like a demon,’ I said, getting the first laugh of a memorable day. David Jones was born on 8th January 1947 at 40 Stansfield Road in Brixton where he lived until he was seven when his family moved to Bromley. 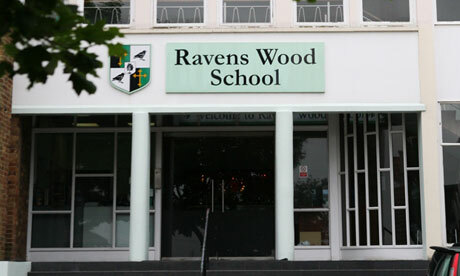 He went to a local junior school before arriving at Bromley Technical High School for Boys (now Ravens Wood School) in 1958. And it was her under the guidance of teacher Owen Frampton, the Head of the Art Department and father of guitarist Peter, that Bowie’s creative side began. He was a superb dancer and played saxophone with Peter Frampton in a school band called The Little Ravens. And it was here in 1962 that he received a punch in the eye from his friend George Underwood, that left him with a frozen pupil. Bowie had taken George’s girlfriend Carol and the unfortunate result gave Bowie a unique look that fitted perfectly with his soon-to-be-famous image. 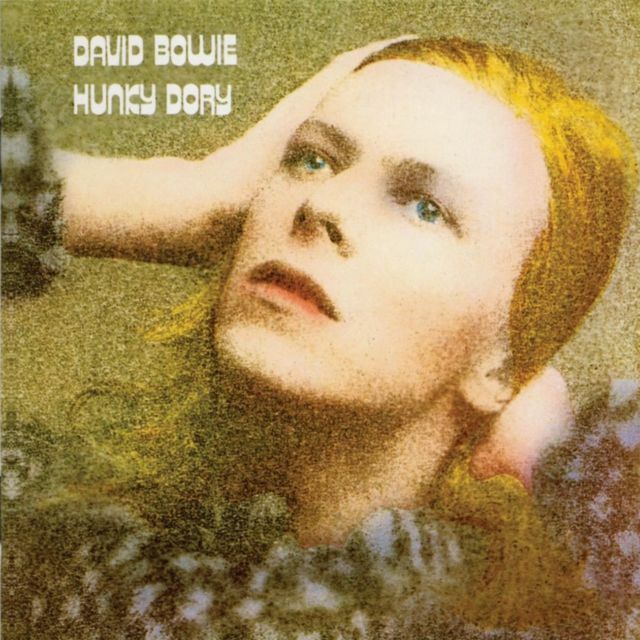 George went on to become very successful in the art trade and was involved in designing the album covers for Hunky Dory and The Rise and Fall of Ziggy Stardust and the Spiders from Mars. My cousin turned up the volume on John, I’m Only Dancing as we passed the old school where rock legends once learned to play. After leaving school Bowie worked for a time as a commercial artist and continued his musical journey by playing in different bands. One was a group from Margate and they performed as Davy Jones & the Lower Third, but he left after recording a few singles that failed to make an impression. Later he made the first of the many changes that he became famous for when he dropped Jones for Bowie. This was because another Davy Jones, from Manchester, was becoming famous as the lead singer with The Monkess and Bowie did not want to be confused with him. Soon we were near Beckenham where Bowie moved to after he left school. And that was when we had to stop because of major roadworks. I would normally be unhappy at sitting in traffic but now was fine as we listened to, in particular order that I remember, Space Oddity, Let’s Dance, The Jean Genie, Suffragette City, Life on Mars, Oh! You Pretty Things, Changes, Starman, Rock n’ Roll Suicide, Rebel Rebel and Diamond Dogs. ‘It’s a magnificent collection of songs,’ I commented, realising that there so many more to follow. And who was I to argue! 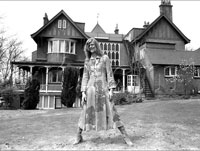 In October 1969 Bowie moved into Haddon Hall on Southend Road. He lived in the ground floor apartment and painted the ceiling silver to remind him of the night sky. He married Angie Barnett on the 19th March and the large house (now sadly demolished) soon became home to his band The Spiders from Mars. Bowie loved parties and over the next three years while they lived there it was one of the most popular ‘party houses’ in London. 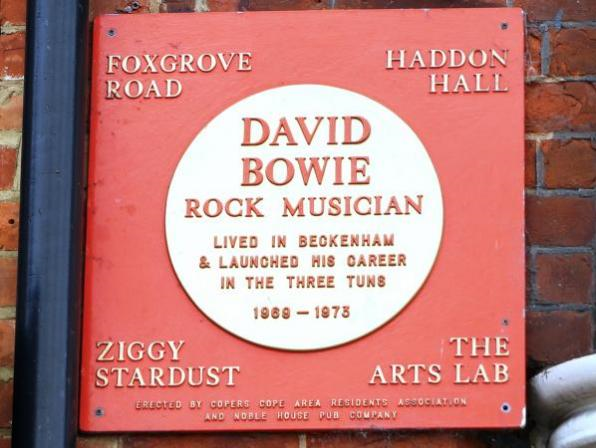 And it was here that most of the Ziggy Stardust music was first heard before it was taken into the recording studio. Close by is The Three Tuns pub on Beckenham High Street where he had played his first gigs in 1969, and there is a red plaque on the front of the building (it is now a Zizzi restaurant) in his honour. 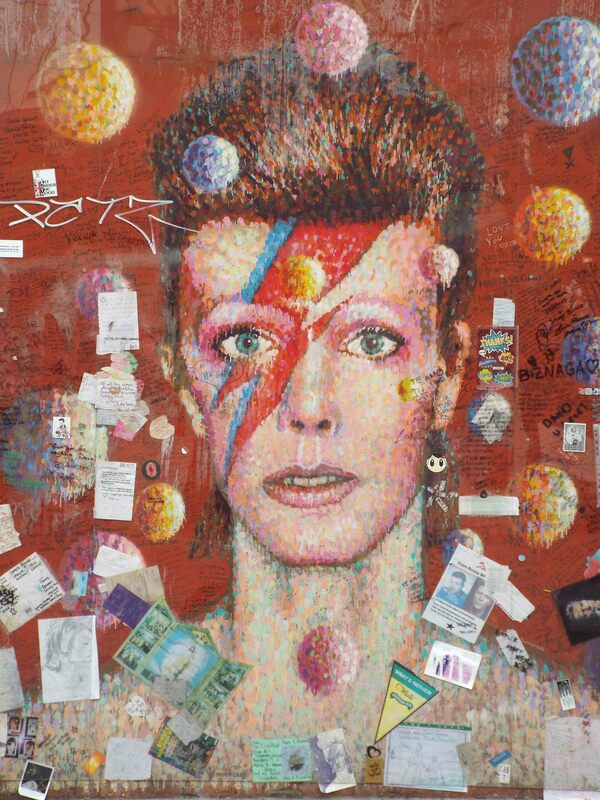 ‘And, a lady called Suzi Fussey, who worked in a hairdressers across the road from the pub, gave him the haircut that was associated with all things Ziggy Stardust,’ my cousin added, slowing the car before briefly heading off to Brixton and the end of our trip. We walked to the memorial on Tunstall Road, opposite Brixton Underground Station, where a small group of Spanish fans were taking photographs. I took their camera and happily snapped off a few photographs before taking my own shots. 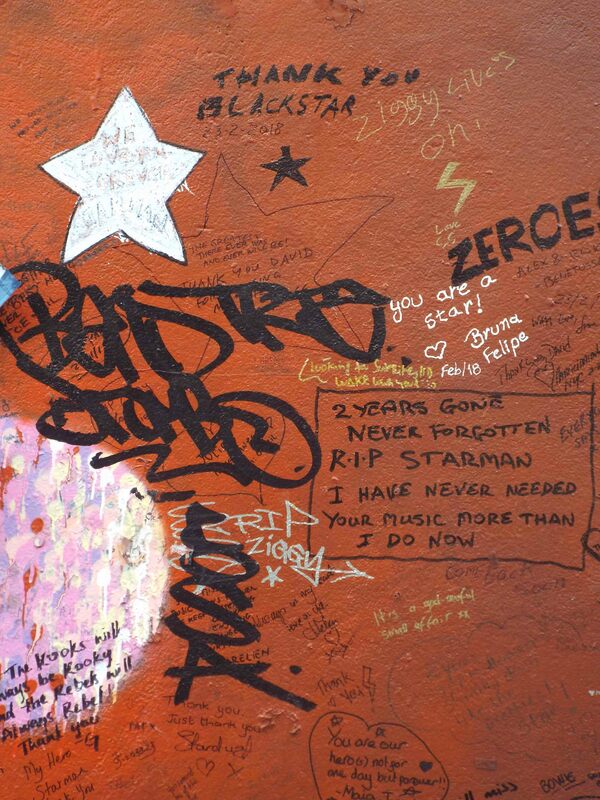 The memorial was a spontaneous reaction to Bowie’s death and the local council has now protected the painting and comments behind a sheet of heavy, clear plastic. It works, and as my cousin and I stood there in quiet contemplation one of the Spaniards turned up the sound on his mini player and we smiled and sang together, each one of us knowing that as long as we believe ‘We can be heroes, just for one day’.